Turkey Point Lighthouse is located in the Elk Neck State Park in the upper Chesapeake Bay. The historic lighthouse is situated atop a 100 foot bluff that overlooks the Elk and North East rivers. 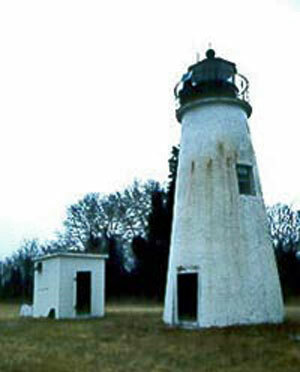 With a total elevation of 129 feet, Turkey Point Lighthouse is the highest lighthouse in Maryland. Turkey Point Lighthouse is a conical brick and masonry tower design, similar to Concord Point Lighthouse. In 2000, the U.S. Coast Guard decommissioned the lighthouse and extinguished the lamp. The lighthouse has been since been re-lit and listed as a “Private Aid to Navigation.” The lighthouse is also listed on the National Register of Historic Places.